Patrick and I attended opening night of the Burial at Thebes at the Guthrie Theater. Opening nights always include a little reception – think free wine or champagne. And think attended by people link the playwright – who was Seamus Heaney. 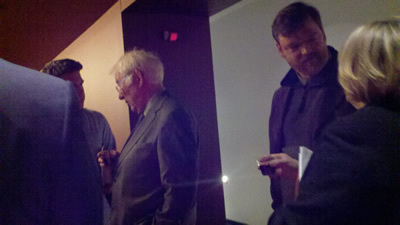 Guthrie artistic director Joe Dowling introduced Patrick (and me but that’s not such a big deal) to Seamus Heaney. In the picture, Patrick is actually standing near Seamus and is talking to his wife. 1. I hope Patrick asked Heaney to write something for Celtic Players (after all, we have a relative of his in the company). 2. Did Heaney have trouble understanding Patrick because of the accent?